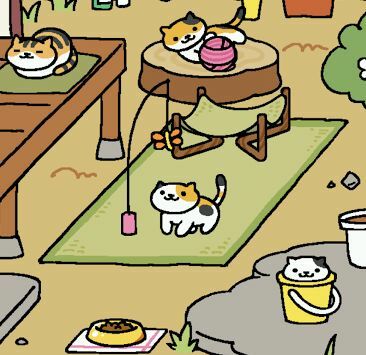 Have you heard of Neko Atsume? It is one of those app games that kids go crazy for these days and Dollissa and I are not immune to the hype, ourselves. Is there actually much hype over it? Not enough, I tell you. Not enough by a LONG shot! I will wait here while you immediately rush out to obtain it from your respective app store. It should only take a moment. Then, come back here to read the rest of this because you will be momentarily confused, giddy with possibilities and promises of round little cat drawings. I’m sure the Japanese words are full of impossibly cute descriptions. Maybe you can read it and tell me it is true? However I, and I will assume most of the rest of you, can’t read it at all but that’s okay. You aren’t there to read, you are there to gather cats to you with food and toys. 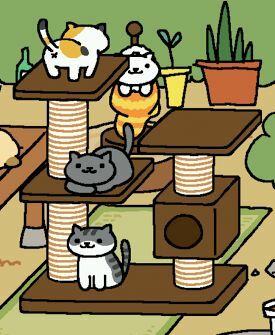 At first, there will be no cats in your space, so you will have time to frantically click on menu icons to take up time. You will find that you memorize the icons and their reasons fairly quickly. There is an area where you can look at your cat collection, there is a store, your inventory, a camera, a button to take you back to your courtyard, a sardine gifts area, settings, treasures, and a few buttons I don’t bother with. A cat will have turned up by now, lured to you by a food you have selected and at least one item you have purchased from the store. Of course, at this point in the game, you will have bought several items and fretted over the quality of the food you have set out and changed it a few times. Tap the new cat friend. You will be taken to its profile. There are probably adorable notes but you can’t read them. Touch the golden bar up top where it looks like a name should be. That’s its name and you can change it! You are now on your way to Satisfaction Town. 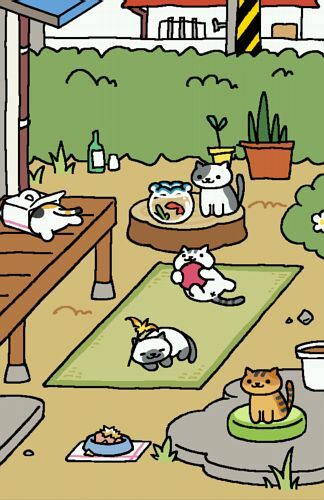 Use the camera feature to take photos of the cats playing and sleeping. In their profile, you touch the little cat icon over to the right side and it takes you to a gallery full of pictures you have snapped of that specific cat. Choose the best one by tapping twice and it becomes the profile picture of that kitty. Change it multiple times a day! When you name your cats, they become a little more real. But when you take pictures of them in different poses and different places using different objects, they become practically ALIVE. Suddenly they have preferences and needs! The preferences and needs are all exactly the same for every cat, but there are so many choices that your pictures have enough variety to keep you from being bored. The game doesn’t appear to refresh if you stay on it, so you quickly learn to close it after a hurried maintenance and progress check. Make sure the food level is good (but let it run out sometimes in order to collect from a certain fat cat). See if you have gained any new feline friends. Collect gifts and treasures from thankful kitties. Then go do important real life activities to pass the time until it is okay to check again. What has changed now?? Nothing! Close and open the game until something finally happens. This is a buddy game; you can’t play it alone. You have to have someone to talk to about milestones. The camera has a function where you can take pictures of the entire yard. Take thousands of these pictures and send them to your friends. Tell everyone when you get a new cat. List the names you’ve given. Be full of wonder as you compare the different names you have given to the same colored cat. List and compare your received treasures. You use silver and golden fish to buy things in the store for some reason. 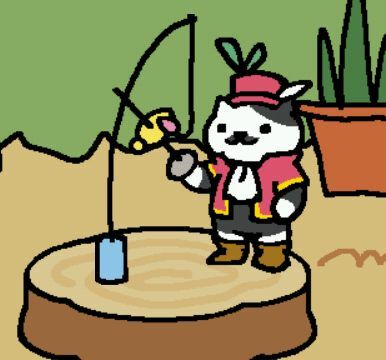 You obtain fish by keeping the cats happy. 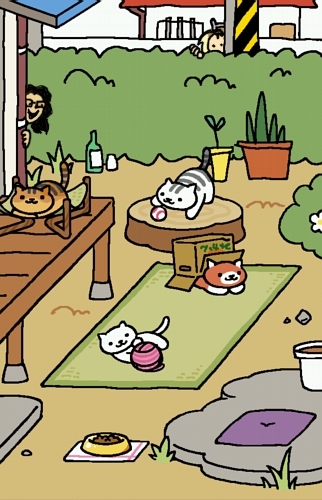 Eventually, you will decide to buy a setting expansion in order to curry the favor of more cats. This requires forethought and willpower. Similarly, you will begin setting goals for high-fish items such as a gigantic cat tree that takes up all the floor space. Achieving your own goals makes you feel good. This game keeps on giving! While waiting for a change in cats, or, God willing, the arrival of a brand new charge, it is a good use of your time and energy to carefully go through each of the ones you have already collected. Look at their carefully selected name. Repeat it to yourself while looking at their little photo. Maybe choose a new photo of that cat, one that captures their mood you’ve decided they are in at the moment. Go to the next cat and repeat the process. Someday you will have them all memorized probably! What a day that will be. Step 10: Check Again Maybe There’s a Treasure or New Cat??? When the screen darkens and one of the kitty cats walks into your center stage, you will know a real thrill of joy. That kitty cat has decided to reward your kindness with a treasure: the ultimate goal of the game. You are collecting cats and items, yes, but treasures are much harder to come by. It takes patience. They cannot be bought. And each new arrival means there is another chance at another treasure. It’s enough to make you want to check every FIVE minutes. It’s enough to make you want to check RIGHT NOW.